Deviled eggs never had it so good stuffed with bacon guacamole! It is hard to think about Easter without thinking about eggs and deviled eggs are a great way to include some eggs in your Easter menu. Deviled eggs are hard boiled eggs that are served cut in half and stuffed with a mixture that typically includes the egg yolk along with some mayonnaise, mustard and a touch of hot sauce or a garnish of chili powder. Although your basic deviled eggs are great all by themselves you do not have to stick with the basic filling; you can go crazy with the flavours and one of my favourite ways to stuff them is with guacamole! 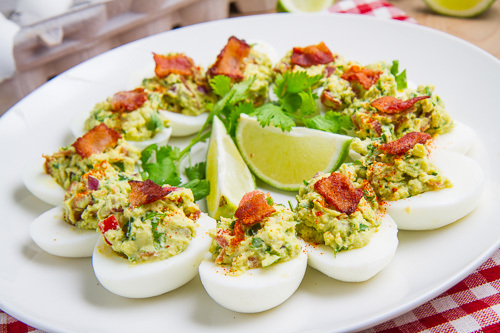 You cannot go wrong combining two already amazing things like eggs and guacamole in a new dish like guacamole deviled eggs! As good as the guacamole deviled eggs sound I could hardly resist stopping there and I had to throw in another amazing ingredient, bacon! 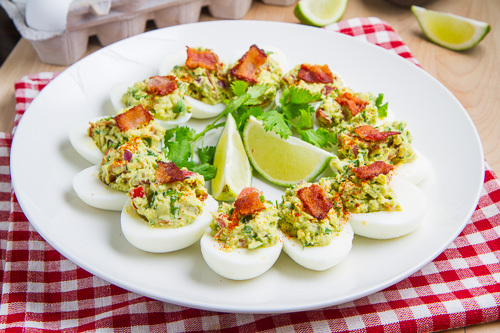 Bacon and eggs is a match made in heaven and bacon and avocado is not far behind so why not combine them all in bacon guacamole deviled eggs? 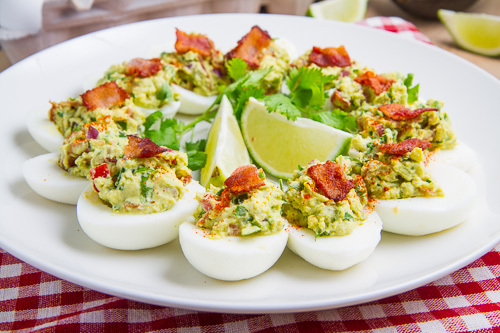 No matter how you cut it, these bacon guacamole deviled eggs are bound to be a hit at your Easter gathering! The only real problem with these little gems is how quickly they will disappear; so make a lot! So pretty and finger lickingly good! Scoop the yolks out of the egg halves, mash them, mix with the avocado, bacon, jalapeno, onion, tomato, lime juice and cilantro and season with salt, pepper and cayenne. Place a tablespoon of the mixture back into the holes left by the yolks in the eggs and serve garnished with extra bacon and a pinch of chili powder. These look delicious!!! What an awesome combination of bacon, eggs, and quac! Yum!!! A wonderful idea! Those deviled eggs look succulent. You are killing me! Those look awesome! These look like the perfect deviled eggs! Wish I could figure out how to add the recipe's to my Recipe box. Looks delicious. Anonymous: Just click on the blue Save Recipe button just above the ingredients list to add the recipe to your Recipe Box. Bacon makes everything better, like your spin on this. Love your spin on the traditional deviled egg! normally these scare me a tad, but these look freakishly good! I might have to make these on EasteR! I've GOT to try these. Avocados are my favorite. Now this is a deviled egg recipe I can embrace!!! Love all the flavors in these deviled eggs Kevin ~ wish I could 'em have for lunch! Oh yum! I love the bacon addition! oh my gosh seriously. seriously!?! the fam is going to go crazy for these at Easter. So funny, you are the 2nd person I have seen make avo + egg something. Love this! Looks so delicious! Love your take on these! I love your recipes ,very inspiring, but they are not low calories and you don't look fat. How do you manage? I never thought about adding guacamole to eggs. Awesome idea!!!! I will have to share this!!!! Wow! This looks amazing! I've been looking for a mayo-free deviled-eggs recipe and this one looks absolutely DELICIOUS! And just in time for Easter 🙂 Thanks! These sure do sound and look GOOD. I don't like most deviled eggs as I'm not fond of mayonnaise. But YOURS don't use any! I think I might actually like yours! Thanks. 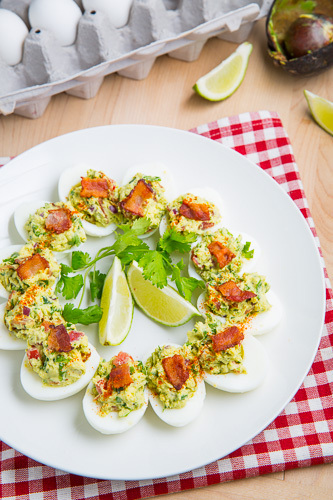 I've had my eye on guacamole deviled eggs or avocado deviled eggs, but the addition of bacon is a must! I made these this morning and they were a bit bland – in need of a little something. I found that difficult to believe, looking at the list of strong flavors that were added, but it was true. They need a something to spark the ignition, kinda like salt does, but better. I think perhaps a teaspoon of a mild pepper sauce (i.e. Frank's Red Hot®) or maybe 1/8 teaspoon of ground cayenne would help out. Substitute that for the more earthy chili powder in the filling, but still use chili powder as a garnish. also, this recipe makes *lots* of filling, so don't hesitate to really stuff those egg halves! WileyP: The recipe actually does call for seasoning with salt, pepper and chili powder to taste. I generally go easy on the heat sources like the jalapeno and cayenne in recipes for those that do not like it as hot but you should definitely increase it if you like like it spicy. A hot pepper sauce would definitely work as an extra heat source! The lime juice and cilantro should also be adding a lot of flavour here not to mention the bacon. Just made this – outstanding, my wife gave it three gold stars (highest rating) plus a smile. I won't change a thing…. These are the best deviled eggs I have ever had. They are a major hit everywhere I take them. The only thing I did different was add a small amount of mayo. I made these a couple weeks ago and they weren't very good. I was so excited to try them because they look and sound so good. No one liked them. I always get a giggle out of recipes that make you "Re-invent The Wheel" as part of their ingredients. LOL I read the list and then said, "So, you add some Pico de Gallo to mashed eggs and an avocado, right?" Oh and some bacon, too. No need to buy all the veggies if you have a proper grocery store that sells dips and spreads. Just made and it was so so yummy. The chili powder gives it the last yummy kick. Congrats on a great recipe. My question…..how far in advance could this be prepared? Thank you for any further help. Lexy: You could make them a day or two ahead of time. If you do this the bacon will not be nice and crispy so you could also hard boil the eggs a couple of days ahead, make the guacamole, minus the bacon, a day ahead (store it in a container in the fridge and cover it with lime juice to prevent browning), then cook the bacon and assemble on the day. Enjoy! These deviled eggs sound delicious! Why have I never put avocado in them before? I will defently try this tasty dish for the breakfast.